Is a large wolffish the result of the Fukushima Daiichi nuclear accident? However, there are now concerns that the mutant wolffish is a result of radiation from the Fukushima nuclear disaster. Usually growing to a size of 1.1 metres and a weight of 15kg, Hiroshi’s find in the Pacific Ocean – off the coast of island Hokkaido near eastern Russia – measured closer to two metres and boasted a mouth large enough to accommodate a human child. The massive fish raises further questions about the impact that the 2011 Fukushima nuclear power plant disaster had on surrounding marine life. Last year, giant catfish were discovered close to the site of the 1986 Chernobyl nuclear catastrophe in Ukraine. and in the Daily Mail as Fisherman reels in SUPER-FISH off the coast of Japan. The blog EarthTouchNews says it isn't the result of the nuclear accident, saying NO, THIS WOLFFISH IS NOT A FUKUSHIMA RADIATION MUTANT. Wolffish normally grow up to around 110 cm and the largest ever recorded wolfish was approximately 150 cm. Mutagenic studies of endpoints including body weight and length of fish suggest that chronic irradiation interacts with other environmental variables to influence the degree of response, although the irradiation itself appears to be a minor contributor. The 'giant' wolf fish caught between the mainland and Hokkaido island by a fisherman named Hiroshi Hirasaka (images of which he shared on Twitter) was around 110-120cm in length which was quoted by the fisherman himself as "they are the average size (TL110-120cm) in this area". This 120 cm wolf fish is small when compared to the largest ever recorded wolf-fish of 150 cm. Also the forced perspective in the picture taken is explained by Hiroshi Hirasaka himself in the twitter message quoted below. Timothy Mousseau, Professor of Biological Sciences in the University of South Carolina said that it is "extremely unlikely" the contamination had anything to do with the wolffish's unusually large size. First and foremost simply because usually the effects of mutations are to reduce growth rates to make things smaller," he said. "They grow less efficiently, they're less capable of catching food and they tend to not live as long. Most of the effects of increased mutations are deleterious. Very very few mutations lead to extra-large size." It's just a really lucky catch by this fisherman. If you look hard and long enough there's always a few that manage to survive long enough to achieve these large sizes. Fish have what we call indeterminate growth, which means as long as they are living they tend to get bigger and bigger and bigger. So there's usually a good relationship between size and age. If there's enough of them out there and nothing eating them and no one fishing for them, then they can live long enough to reach large sizes." Mutations are not impossible, but very unlikely per Larry O' Hanlon. The reason is that nuclear radiation is not magical, but particulate. It consists of lots of tiny bits of matter shooting out of unstable atoms. Those bits can sometimes have enough mass and energy to penetrate our skin and enter living cells where it can randomly damage genetic material. Expecting a high dose of radiation to improve an animal -- to give it any big advantageous changes all of a sudden -- is a bit like opening fire with an assault rifle on a block of marble and expecting Michelangelo's statue of David to be the result. A length of 5 feet seems about the maximum in Gulf of Maine waters; one more than 4 feet long is seldom seen, and the larger fish caught and brought in run less than 3 feet. European authors speak of wolffish of 6 feet and even longer, but they average only about 2 feet in Scandinavian waters, i. e., scarcely so large as those in the Gulf of Maine. A fish 33 inches long weighs about 10 pounds, one of 37 inches between 16 and 17 pounds. The greatest weight reported for American waters so far is about 40 pounds. The probability of Fukushima radiation causing the mutation of fish in the area where Hiroshi Hirasaka caught the giant wolf-fish can be denied on the following factors listed below. 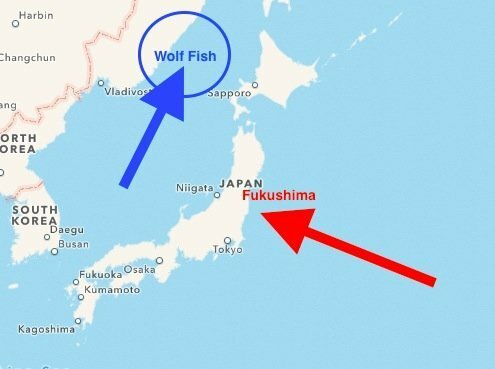 The location of the nuclear disaster is significantly far away on the other side of the site of the catch of the 'giant' wolffish and the ocean currents in the area that the wolf fish was caught, come from clean areas that have not yet been contaminated by Fukushima. Also the heavy contamination flowed away from the area that the fish was caught. The levels of contamination in the area the fish was caught are probably unaffected by Fukushima's contribution since high levels of radioactive contamination might have not made it across the island which was further made more difficult by the location of the area which is far away from the areas affected by Fukushima radiation leak. Per Ken O. Buesseler et.al. 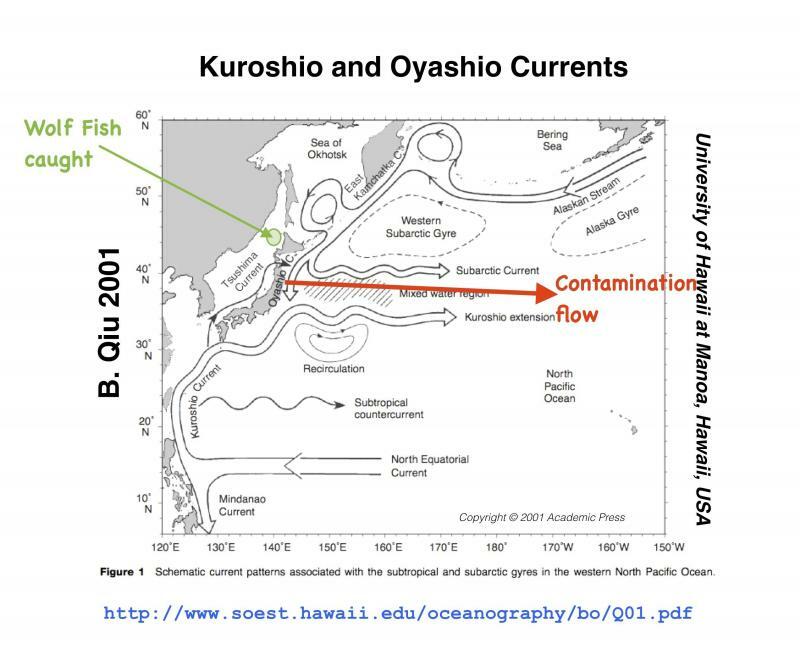 in 2012, radiation risks due to radioactivity releases (radionuclides) from the Fukushima Dai-ichi nuclear power plants to the Northwest Pacific Ocean are below those generally considered harmful to marine animals and human consumers, and even below those from naturally occurring radionuclides. Caesium contamination in the area where the 'giant' wolf-fish was caught are near low levels. The longer lived caesium isotopes (2 y half-life for 134Cs and 30 y half-life for 137Cs) could be transported over long distances by ocean currents, mainly eastwards by the Kuroshio current system. However, the great quantity of water in the Pacific Ocean will rapidly disperse and dilute these radioactive materials. Testing of seawater 30 km off the coast of Japan has shown that the concentrations of radionuclides have dropped rapidly to very low levels and are of no public health concern. Measurable levels of Fukushima-Caseium have been only been found in Pacific Blue Fin tuna until now. The nuclide analysis results of other fish and shellfish is recorded here. In a worst case of consuming fish at the highest concentration (about 1000 Bq kg−1 of caesium) reported in July 2013, one normal fish meal of 150 g can give radiation doses of 1.7 µSv to children and 2.3 µSv to adults. The doses are 8 and 42 % of radiation doses from naturally occurring radionuclides commonly found in fish for children and adults, respectively. 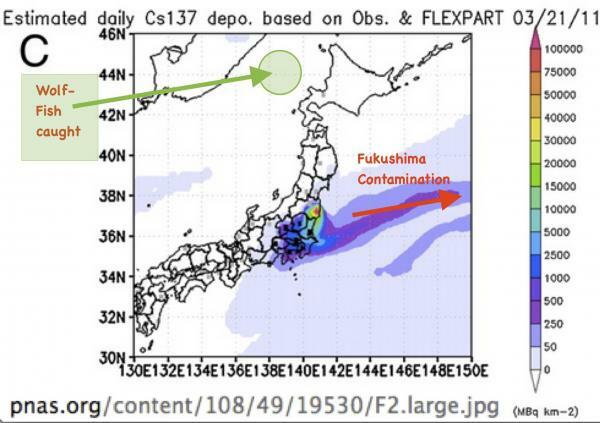 Observations from June 2013 shows the spread of Cesium-137 was on par with the predictions by Rossi et al., but the concentrations are safe and lower than predicted. Naturally occurring radionuclides exist in the environment in the air we breathe and in the water we drink. So it is not a surprise that naturally occurring radionuclides can also be found in varying concentrations in fishery products. 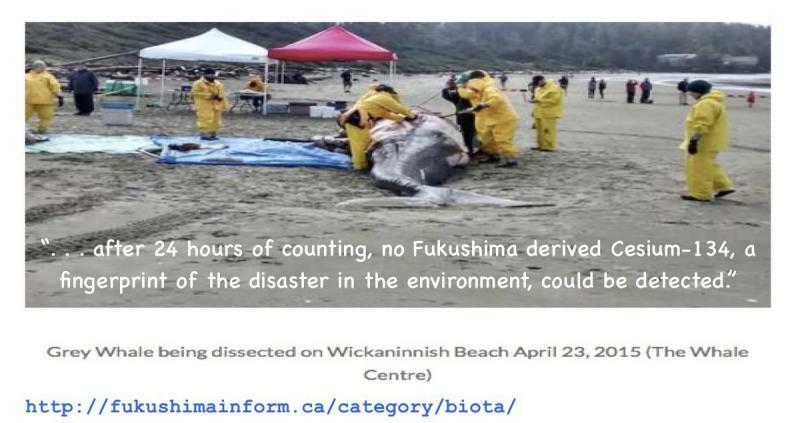 Radioecologist F. Ward Whicker said that "the concentrations of iodine and cesium levels "would have to be orders of magnitude larger than the numbers I've seen to date to cause the kind of radiation doses to marine life that would cause mortality or reductions in reproductive potential." Not the answer you're looking for? Browse other questions tagged zoology japan fukushima-daiichi . Does this video show Fukushima Daiichi radiation in San Francisco?